New Billboard in Times Square: THANKS FOR NOTHING AOC! 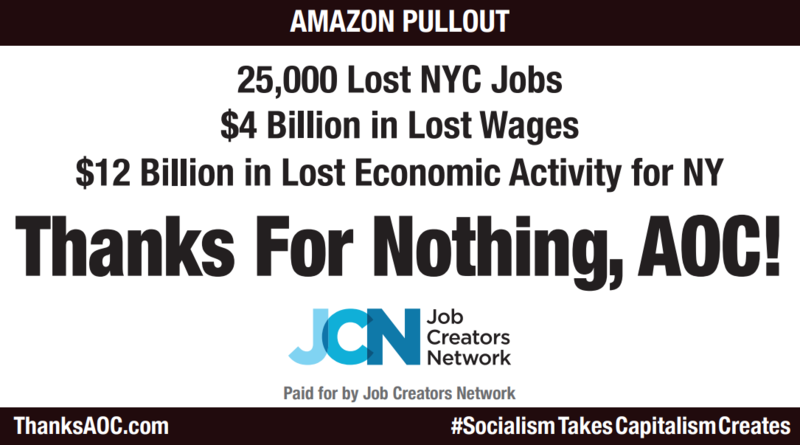 Washington, D.C. (February 20, 2019)—Today, the Job Creators Network is putting up a billboard in Times Square calling out Rep. Alexandria Ocasio-Cortez for the role she played in the recent termination of Amazon’s HQ2 that was planned to be constructed in Queens. The pullout of Amazon—because of anti-business politicians, notably Ocasio-Cortez—is a major blow to the New York economy. The retreat will not only cost the area $12 billion in economic activity, but 25,000 new jobs that would have paid an average salary of $150,000. Visit ThanksAOC.com to learn more. The billboard—which is located on 42nd Street near 8th Avenue—will be displayed for one week beginning today and is headlined “AMAZON PULLOUT, Thanks For Nothing AOC.” The ad goes on to highlight the economic consequences of Ocasio-Cortez’s actions and ends with the hashtag, #SocialismTakesCapitalismCreates.